1. A full time captain/guide-hostess who will guide you around the islands of the Saronic and Argolic gulf. 2. Breakfast (continental), midday lunch (including light salads and sandwiches), sodas, snacks, fruits, refreshments (non alcoholic beverages), etc. supplied on board during the hole weeks charter. 3. Visits to archaeological and historical monuments. 4. Fuel, water and, ice for the yacht, for the whole week. 5. All linen, towels and blankets. 6. Free use of all yachts equipment. 7. Greek VAT taxes, Port dues, Marina fees, insurance. 8. Cleaning fee at the end of the charter. 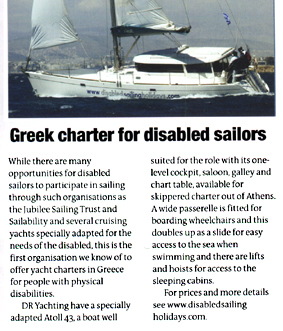 While there are many opportunities for disabled sailors to participate in sailing through such organisation as the Jubilee Sailing Trust and Sailability and several cruising yachts specially adapted for the needs of the disabled, this is the first organisation we know of to offer yacht charters in Greece for people with physical disabilities. DR Yachting have a specially adapted Atoll 43, a boat well suited for the role with its one-level cockpit, saloon, gallery and chart table, available for skippered charter out of Athens. A wide passerelle is fitted for boarding wheelchairs and this doubles up as a slide for easy access to the sea when swimming and there are lifts and hoists for access to the sleeping cabins.